Made from real potato. Natural flavourings. Suitable for vegetarians. Tonight's Special Cottage Pie Simply use your favorite recipe and top with Batchelors Smash, for an even more smashing taste! Directions This pack contains 9 portions. 1 Portion - Take 30g of Smash, add 150ml (approx. 1/4 pint) of boiling water, mix with a fork. 3 Portions - Take 90g of Smash, add 450ml (approx. 3/4 pint) of boiling water, mix with a fork. 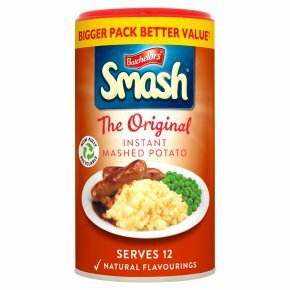 6 Portions - Take 180g of Smash, add 900ml (approx. 1 1/2 pint) of boiling water, mix with a fork. 9 Portions - Take 270g of Smash, add 1350ml (approx. 2 1/4 pint) of boiling water, mix with a fork. Add more flake or water for desired texture. Chef's Tip! For an even more smashing taste, add butter or milk and season with salt & pepper. Not suitable for infants under 12 months.<br>Do not use if pack is open or torn.